Every age requires the proper choice of footwear which enables the feet to develop naturally and contribute to the well-being of the whole body. The most natural way is to walk barefoot on rough surfaces, such as stone, sand or grass. Walking on these surfaces encourages the natural and healthy development of the muscles of the feet and stimulates the nerve fibres. Because of weather conditions, hard surfaces and our way of life, we are forced to wear shoes which is a very important factor in the healthy development of the feet from the first step on. Footwear protects our feet from injuries and cold. So the proper choice of footwear is crucial regardless of age, since it enables the feet to develop naturally, and contributes to the well-being of the whole body. roomy: a child’s feet grow very quickly, so we must choose shoes which are big enough. In this way the shoes do not squeeze the front part of the foot, since children’s feet are normally wider. flexible: a flexible sole, good flexibility over the toe joints and a soft upper part of the shoe are essential for a good shoe. Natural materials allow better ventilation of the shoe and provide more comfort. Each child has a unique foot development which is different from other children, so wearing hand-me-down shoes is not recommended. size of the shoe: the shoe must not squeeze the front part of the foot at its widest point, the front part should be wide enough for a child to grasp the surface with their toes, but not too big so the foot doesn’t swing or the shoe doesn’t come off. height of the shoe: the shoe should not be higher than the ankles, except in special weather conditions. flexible sole: the sole of the shoe should be flexible over the toe joints and should have a soft upper part. anatomical shape: provides comfort, protection and gentle support to the feet. This is not an orthopaedic shoe, since it does not treat abnormalities of the feet. inner shoe sock: made of soft and natural material for extra comfort when walking. The shoe sock should provide the necessary ventilation and flexibility to the feet when walking. 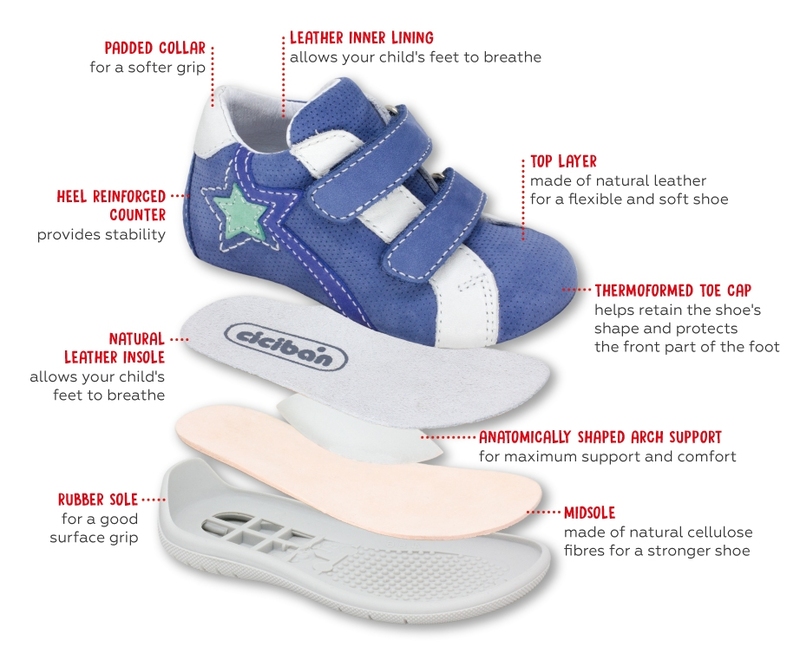 soft and breathable: made of natural materials which allow your child’s feet to breathe. low heel: so the weight of the body can be distributed evenly over the whole foot. Because of its anatomical shape and manufacturing method, Ciciban children’s shoes provide proper flexibility, protection, comfort and stability for your child’s feet. The picture is symbolic. The described features can vary, depending on the model of shoe. In order to maintain the original quality of the materials and the appearance of the footwear, correct and attentive care with suitable shoe care products, as well as correct putting on are necessary. Ciciban footwear are made of natural leather, processed with eco-friendly methods and dyed using natural water-based dyes. In order to maintain the original quality of the materials used and the original appearance of the footwear, a correct and attentive care using suitable shoe care products and their correct application are needed. To make it easier to care for Ciciban footwear, here are some useful tips on how to keep your shoes in tip-top condition. Shoes made of smooth leather should be cleaned with a brush or a cloth to remove the residues of old shoe polish. Then use the brush to put on some shoe polish and allow it to absorb. When the shoes are dry, just brush them. A dry shoe should be cleaned with a nubuck brush. For more stubborn marks and stains, use a soft rubber block, used like an eraser, so the material maintains its character. Cover up the marks with a special rubber brush and use its narrow end to reach the parts which are difficult to access. Use a waterproofing spray to protect the shoes against rain. Use the spray before you wear the shoes and wait for it to dry. It is recommended to use the waterproofing spray twice a week. Patent leather shoes should be cleaned with a cream or liquid for patent leather shoes. Before applying the cleaning product, the shoes must be dusted off. The shoe care products must not be applied with a brush, since it can damage the material. When the cleaning cream is absorbed you can polish the shoe with a clean cloth. Sport shoes should be brushed off when they are dry, whereas the stubborn stains are removed by a rubber. A waterproofing spray can also be used to protect the shoes against moisture. Most Ciciban footwear is intended for dry weather or places, except the footwear which is specifically marked as waterproof. The waterproof footwear has a C-TEX membrane which is waterproof, breathable and warm. Every shoe must be protected against moisture, rain, snow and mud with special weatherproof sprays and creams, so the shoes become moisture-resistant and maintain their flexibility. Special attention is advised when drying wet shoes. Wet shoes should be dried at room temperature and should not be exposed to sources of high temperatures, such us radiators or fireplaces, otherwise the shoes will lose their softness and flexibility. Shoes should not be dried in the sun, since this can cause discolouring. However, it is recommended to put some paper inside the shoes to absorb the excess moisture and help maintain the proper shape of the shoes. Shoes should be put on using a shoehorn which helps to keep the proper shape of the shoes. If a shoehorn is not available, you should put the shoe on by firstly pushing the foot as deep as possible into the shoe and then pushing the heel inside. The wide range of Ciciban models offers something for every age and activity of your children. Ciciban's wide selection of shoes uses various materials of different qualities. Ciciban footwear are suitable for all ages and activities of your children. However, different activities and weather conditions require materials of different qualities which guarantee the healthy development of their feet. The wide selection of Ciciban models allows your child’s every step to be a healthy step towards new adventures in the future. Depending on your child’s age and purpose of use, Ciciban can offer advice on which shoes are most suitable for your child. The Ciciban lines Marines, Over and Mini are the most suitable for your child’s first steps. Children’s shoes are made of the highest quality natural leather. They are distinguished by their comfortable last and extremely flexible sole which enable their necessary flexibility and help your child to make their first steps. The anatomically shaped shoe sock gently embraces and supports the arch of the foot and offers everything necessary for a healthy development. With the Marines, Over and Mini lines, your little ones will be comfortable as well as trendy. Ciciban sport shoes are distinguished by their soft and breathable upper part which prevents excessive sweating. A soft inner layer guarantees the best protection against knocks and pressures which are unavoidable for children’s feet in various everyday activities. The selection of trendy, light and comfortable footwear for active children is wide. Special occasions in life also require special shoes. Ciciban offers various models of flats and sandals for little princesses who love to be at the centre of attention. The shoes are made of natural and fashionable materials. 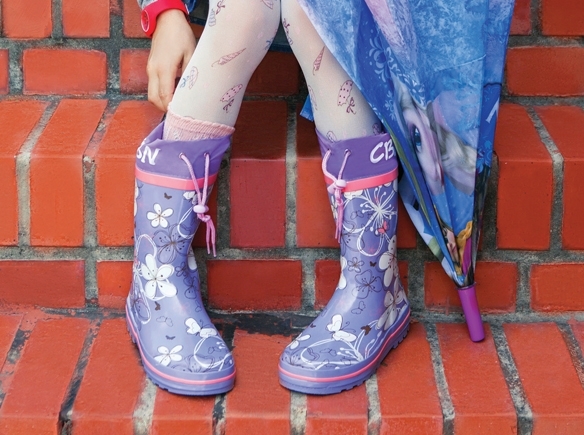 Ciciban rain boots are comfortable and soft and guarantee dry and warm feet. A wide selection of models and colours will please the little ones who love to jump in the puddles. For dry and warm feet in snowy conditions, Ciciban offers a wide selection of snow boots. They have a C-TEX membrane which is waterproof, breathable and warm. The membrane protects the feet from the outdoor weather conditions and allows them to breathe optimally. So the water does not get into the boot, but the moisture from sweating can escape. With the Ciciban Snow line the winter’s pleasures will be even more exciting. 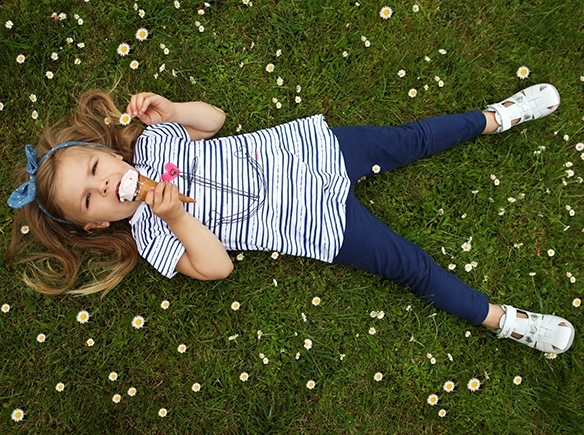 When the days become longer and warmer, children spend more time outdoors, so their footwear must be comfortable and breathable as well as fashionable. For that purpose Ciciban offers a wide range of sandals in spring pastel tones and lively summer colour combinations. The Bio line is a special feature in the summer collection. Due to natural materials, Bio shoes fit exactly and provide comfort with every step. The rubber sole provides softness and flexibility when walking and playing. Ciciban footwear are ideal for all children’s activities at home, in the kindergarten or at school. Comfortable and soft shoes are made of natural materials and are instantly recognizable due to their colourful patterns. Their inner structure allows ventilation, whereas the slip resistant sole guarantees a comfortable and an easy-going stride. The correct choice of footwear is important for every age, therefore Ciciban has developed The Next footwear for teenagers and adults. The Next footwear includes shoe sizes from 36 on. What is the correct shoe size? Measure the actual length of your child's feet in centimetres and add 0.5 cm. Enter the calculated length for the informative calculation of the shoe size or print a sizing chart. Disclaimer: Please keep in mind the calculation provided is valid for Ciciban footwear only. Also, the shoe size calculation s intended to provide an approximation of your true size and it depends on foot shape and shoe model, therefore sizing may vary accordingly. To find the perfect shoes for your feet, we recommend you to always try on your footwear. How to measure the length of your child's feet? When you measure your child's feet, your child should stand. His/her foot and toes must be level with the surface.